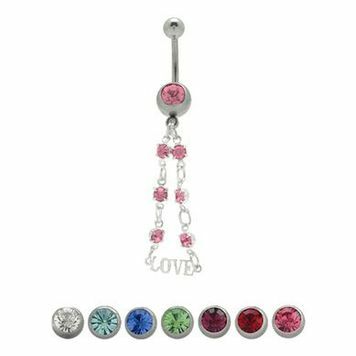 This is an awesome "Love" Dangling Navel Ring. This navel ring has two jeweled chains coming down to "Love" logo. This item comes in clear, light blue, dark blue, green, purple, red, and pink. The size available is 14 gauge with a length of 10mm - 3/8 of an inch. The top bead measures 5 mm. This item is sold individually. This item is nickel free.